Featuring a borderless Advanced In-Cell Touch (AIT) panel and an ultra-narrow 7.2mm bezel, this designer all-in-one is as compact and lightweight as it is elegant. 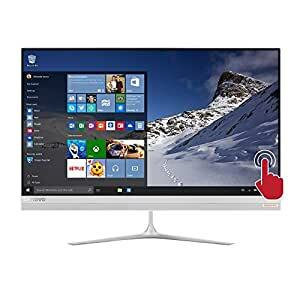 Stylish and super-slim, the Lenovo IdeaCentre All-in-One 510S space-saving PC features a widely adjustable screen angle that rotates from -5Â° to 30Â° and a Full HD 10-point multitouch display. Windows 10, Silver finish. Includes all-in-one, AC adapter, wireless keyboard and wireless mouse. Dimensions: 20.6″L x 1.6″W x 12.8″H, Weight: 9.7 lbs.